By David Ponce on 05/26/14 • Leave a comment! 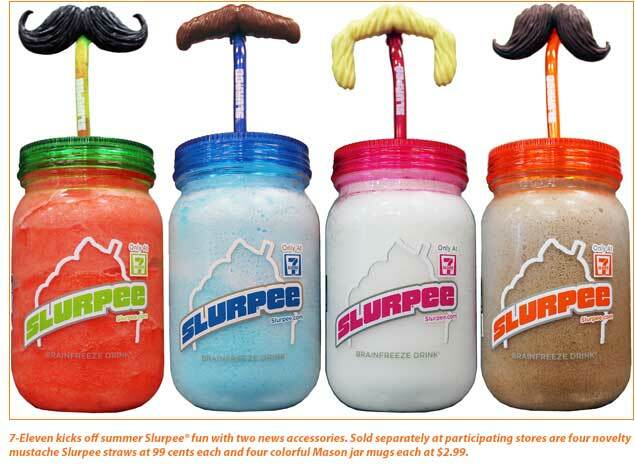 Anyway, that was our half-hearted attempt to segue into the news that 7-11 stores are announcing the launch of the above novelty mustache straws and Slurpee mason jars. We believe they’re catering to hipsters not only because of the obvious association, but because the company appears to admit as much in their press release with the words “on-trend Slurpee accessories”. We think, however, that they’re poking fun at the trend more than anything; it’s not like any self-respecting hipster would ever be caught dead in a 7-11. And that’s just fine by us. There are four straws, unofficially named “The British, The Handlebar, The Hogan after wrestler Hulk Hogan, and The Swanson.” It’ll cost you $3 for the jar, $1 for the straw, and the first slurpee is included.